What? You say that the question is what came first the chicken OR the egg? Not in marketing. In Marketing it is the Chicken and the Egg. You have to be telling your story all the time, not waiting to have your chicken grow up and laying eggs or have the perfect egg to produce the perfect chicken. And it was going to take money (lots, evidently, because it was not built in wordpress, it was built on one of those replicated site platforms that do not help your SEO at all) which they did not currently have. In this economy, marketing your services has evolved. Know that if you rely on people being sold only on your face-to-face meetings, you are eliminating an entire world of possibilities. Those people are also going to check your site out anyway, to make sure they made the right decision. It's the chicken and the egg marketing. Neither of the two came first, they work together. With the Chicken AND the Egg marketing, you have to tell your story, knowing that it is not complete. By example, you are reading this blog on the OurMarketingGuy.com site, but it is just one blog. This post, when taken together with lots of other posts, written over time – the development of the chicken from the egg to adulthood – will help you decide to hire my company to assist you with marketing YOUR company. 1. Rebuild his site in WordPress. 3. Answer the 10 questions (one per blog post) that people ask him all the time, so he can SEND people to his website for information. This also helps build that bond between you and your potential clients. 4. Answer the 10 questions (again, one per blog post) that Johan WISHES people would ask him. 5. More video. Lots more. Tons more. Just like this blog is introduced with a video (also tagged and key worded to both my company and Johan's), his can be, too. Let's let our potential clients gather information they way THEY want to. It could be by video, or the written word. 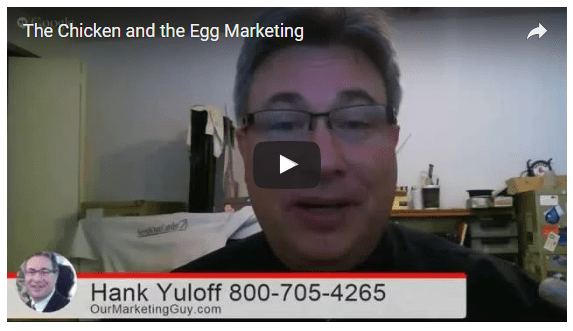 How is YOUR chicken and the egg marketing working? Let's talk about it, shall we? Give us a call at (800)705-4265.